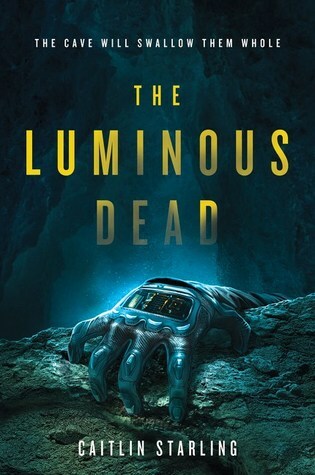 The Luminous Dead by Caitlin Starling is a story about two women who have more in common than either of them would like to admit, but by the time they realize how much they mean to each other, it might already be too late. Gyre was only a little girl when her mother abandoned her, leaving only a vague note with an invitation to her daughter to come find her when she is ready. Now twenty-two years old, our protagonist has finally decided it is time. But first, she’ll need to make enough money to get off her backwater planet and begin her search, and to do that, she has forged her credentials and work history in order to sign on to a dangerous mining operation known to pay its cavers extremely well. Given how much she was offered for the job, Gyre expected to be assisted by team of specialists and scientists, but instead, she finds herself alone in the deep, dark tunnels of the planet with only a single overworked individual on the surface remotely monitoring all her life support and suit controls. Introducing herself as Em, her handler is secretive and uncommunicative in her lofty position of authority, which immediately sets off Gyre’s dislike and mistrust of her. But very soon, as the mission becomes increasingly difficult and treacherous, the two of them have to learn to work together and let each other in, because only then can they save one another and put the ghosts of their pasts to rest. I was torn between like and dislike for this book, and it kills me to have to give this one anything less than 3 stars because it had its moments. However, there were simply too many other things about it that left me feeling disenchanted and utterly frustrated, making it hard to justify a higher rating. The truth is, I probably would have enjoyed the story a lot more had it been presented in a shorter, less repetitive and more condensed form, but as it is, I felt that too many pages were devoted to pointless back-and-forth or were squandered by following our characters as they—quite literally in some cases—walked around in circles. What’s more, I feel the publisher description has done the book a great disservice by comparing it to The Martian and Gravity, because the reality, as I found out, was much different. For one thing, the “intensive drive” that was promised was virtually non-existent. A heart-pounding thriller this was not, so don’t be expecting anything like The Descent. I just can’t emphasize enough the slowness of this book, even though, in all fairness, I have no doubt the measured pacing here was entirely intentional. The plot featured here is the kind that relies heavily on character development and relationship building, a process that understandably cannot be rushed. And on and on, ad nauseum. Granted, the first couple of times this exchange happened, it gave us great insight into the characters’ personalities and dynamic. However, tighter writing and more concise storytelling could have probably conveyed the same ideas in half as many pages. The F/F relationship was also not very satisfying, and considering so much of it was developed under mental and physical strain or was fueled by desperate need and duress, I just couldn’t see it as either healthy or sustainable. Furthermore, I was never convinced of Em’s true intentions of sending people down into those caves. The explanations given were so underwhelming, initially I thought they were a smoke screen to obscure the true reasons which would later be revealed, but nope, that was it. Still, I did mention the book had its moments. First of all, kudos to the author for pulling off what is essentially a novel featuring an extremely limited setting and only two characters. And while at no point did I personally find this “horror” novel scary or disturbing, Starling nevertheless did a fantastic job evoking an atmosphere of isolation and claustrophobia, especially in the sections with the sumps. At times, the hopelessness of Gyre’s situation really got to me, not to mention how all the uncertainties had a way of messing with your head. Scenes of breathless action were few and far between, but whenever they cropped up, they were also well written and suspenseful. Plus, the tunnelers were pretty cool, though we didn’t get to see nearly as much of them as I would have liked. However, at the end of the day, the positives were still outweighed by the negatives, which greatly impacted my experience with this book. Namely, slow pacing and aggravating characters were my main issues, compounded with the possibility that my expectations had been set too high by the synopsis. That said, I don’t want to discourage anyone from checking out this novel if the story’s description calls to you, or if you think this is something you might enjoy. Good luck, and happy caving. Ah that’s too bad it didn’t work for you… It’s a fair review though, this adventure sounds like a hard thing to pull off but I have extremely limited patience for characters who make stupid decisions all the time. I don’t think I will pick this up. Ah darn!! This one of my top anticipated releases for April. I’ll have to wait and snag it from the library instead. Thanks for the heads up!! Too bad, I really had high hopes for this! I have a feeling the slow pace isn’t going to work for me, since you’ve already reminded me of other books where the characters do nothing except talk about WHAT THEY’RE GOING TO DO and then never do it! Oh no! I’m reading this right now and loving it. I’ll come back and read your review when I finish it. I just read your review and I’m so glad you enjoyed it! I am definitely in the minority with regards to my feelings for this one! This was one of the titles I had set my sights on, and on the surface it looked like a good story – especially in the parallel with “Gravity”, but now it turns out that was more of a publicity stunt than anything else. When there are so few characters to carry the story, pacing and personality strength must be flawless, and they seem to be lacking here. It just bugs me so much when blurbs do this – it just sets up unrealistic expectations and causes disappointment when they are not met! I definitely expected more action and more horror out of this – and maybe that’s why I was so frustrated. The characters were difficult to like. On some level, I understand that was the point, but still. I think I would personally want to kill Gyre based on that conversation! Oh, I wanted to slap her silly. I really hate characters were act on impulse and emotions, especially when they are supposed to be professionals dealing in life or death situations. Whelp, I guess that is one I can avoid. I wish this has been a better read for you. I will be getting to it eventually but am a tad worried now. I did manage to finish The Homecoming yesterday and hope to get my review up later today. It was definitely interesting and I kind of feel like it was 2 different books at times. Better luck on your next read. Yeah, I wish it had been better too. I always have such high hopes for sci-fi horror. I just feel like I’m due for a good one now! And I read your review for Homecoming and can’t agree with you more about it feeling like two different books. I think that’s why I was just so WTF about it. Well, I had my eye on this one. In fact I requested through Edelweiss but was declined so feeling a little relieved now (because I have so many books due this month anyway) and I hate that sinking feeling you have when you see a review book that you’re about to pick up receiving poor star ratings. I had put it on my wishlist to pick up a copy but I might go for something that sounds more like my cup of tea. I don’t like the sound of the slow pacing or the character choices! Such a shame it wasn’t written more concisely. I’ve found books like that before, when it’s felt too drawn out, giving it a messy feel that’s too cluttered, to back-and-forth and not decisive or well structured enough to make for fluidly engaging reading. I do love the title title though! Yeah, I think it’s a common issue with debuts – wonky pacing, too much info in some places and not enough in others, messy and disorganized ideas, etc. I think there is a great story in here, but if it had been presented in a novella or short story instead of a 400-page novel, I think I would have enjoyed it a lot more. Oof. Sorry this one didn’t work out. Aw, I was wondering about this one. 😦 Shame. I agree with you regarding the publisher’s description. I think the blurb set the wrong expectations for this one. I really loved it, but I can see why you came away frustrated. Just finished reading the book in a day and I have to say, I felt exactly the same thing! I wasn’t fully convinced by Em’s intentions either and after the big reveal, I was very disapppointed that the story seemed to redeem her and turn her into a “good” character so you can root for her and Gyre to get together in the end. Felt like weak writing. I’d understand Gyre’s dependence and her love / hate feelings for Em, but Em is such an awfully written character that I couldn’t help but wish that the author kept her role as the antagonist straight up all the way to end. It would’ve made things more interesting, especially if Gyre made it out on her own. That being said, the book did have its moments, but yes, it could’ve been trimmed down. Thanks for this review! It’s actually what got me to your blog, since I was looking for someone who like me, wasn’t in the majority when it came to this book.